Reusable Resuscitator﻿ (Infant)(SW72300A) - Shining World Health Care Co., Ltd. Dependable first-aid rescue at home or outdoors. Widely used, from general rescuer party to professional medical application. 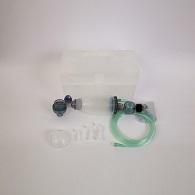 For use in emergency situations to provide lung ventilation to those individuals with impaired respiratory function. Designed for qualified first-aid personnel. Address: No. 22, Lane 116, Wugong 2nd. Rd., Wugu Dist., New Taipei City, 248, Taiwan, R.O.C.